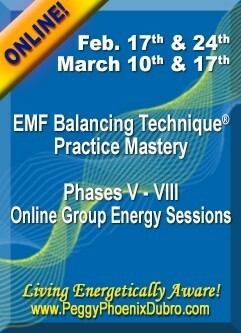 EMF Balancing Technique® Practice Mastery Phases V-VIII Group Energy Sessions - a four-part webinar series. During the months of February and March, individually and collectively we will all be in a heightened state of energetic awareness. This momentous time offers an extraordinary opportunity to accelerate your personal evolution, as you continue to become more present and more of who you are ... a master in practice! For many years I have wanted to offer online group sessions from the EMF Balancing Technique® Practice Mastery Phases V-VIII series. Now, thanks to technology, I am able to create and present an empowering and very special adaptation of the series. Each phase has a unique set of 12 mastery points located on your physical body. During each session, these 12 points are activated with the 12 attributes of mastery associated with that phase of the work. A unique and empowering feature of these sessions is your participation … in partnership with the group, you choose the activation sequence of the attributes. This co-created activation sequence you have chosen determines the unique energy patterns of the attributes of mastery for the session. When you register for these sessions, you will receive instructions on how to make your choices and a link with the names and images of the attributes of mastery. Each phase will have a new document with new attributes of mastery. Follow the instructions for choosing and, if you like, submit the sequence that feels right to you. We will process all the submissions and compose a unique sequence of attributes co-created by the group. Individually and collectively, we co-create powerful new energy patterns for the attributes of mastery we could not do alone … our online community has been proving this dynamic of co-creation to be true for quite some time now! I am sure you will find these EMF Balancing Technique® sessions and the energy patterns of mastery we co-create to be empowering and beneficial on your journey now. I look forward to working together with you as we all continue to master our most precious resource - our personal energy! All of these group energy sessions are offered in the resonance of Infinite Love, and all your responses to these sessions are according to your Infinite Wisdom, because you are saying “Yes” to yourself. This is a great way to co-create! In the first part of this energy session we will activate the Template of Infinite Love, an area that includes the Heart Center, High Heart Center, the throat, all the small energy vortices around the mouth, and the center on the tip of the nose. This activation strengthens and increases the coherent expression of the energy of Infinite Love in every cell of your body, every layer of your DNA, and every light fiber of your being. The session then continues as each of the 12 mastery points on your body are activated with the 12 attributes of mastery associated with this session. The location of the mastery points in this session play an important role in empowering the presence of your purpose and the responsibilities of your purpose, with grace … and … mastery! There are two separate templates in Phase VI, one in each hand. The activation of these Templates of Infinite Compassion from your hands and fingers, along with the activation of the 12 points of mastery, heightens your balanced expression of compassion in action. The energy patterns co-created in this session will take us beyond the current definitions and expressions of compassion. We are here to co-create the new ways of living life energetically aware, personally and collectively. This session amplifies your masterful embodiment of Infinite Compassion … in action. There are two separate templates in Phase VII, one radiating from each of your feet. The activation of these Templates of Infinite Presence, along with the activation of the 12 points of mastery associated with this session are brilliantly grounding ... brilliant because you are! As an ongoing process in your life, you can choose to evolve as a brilliant, wise, wholehearted, person. I am looking forward to working with the sequence of the attributes chosen by the group for this session. The energy patterns we co-create will form new evolutionary foundations as we express more of the original resonance of who we are. In Phase VIII, the Template of Infinite Wisdom radiating from your Crown Center to your Center Above is activated in the resonance of mastery. As the 12 points of mastery are activated in this session, the next highest level of coherence is established between all the templates, all the mastery points, and all the attributes of this series. Now you express your unique practice of mastery in greater focus and clarity according to your Infinite Wisdom. May you attain even higher levels of coherence as you continue your practice of mastery … always.